Google Maps has now added more to their mapping feature. When searching for a map of any city, you will see options to see photos, videos, and User-Generated Maps for that specific area on the left pane. The Photos are pulled from the popular photo sharing website, Panoramio. The Videos are pulled from geotagged YouTube Videos. 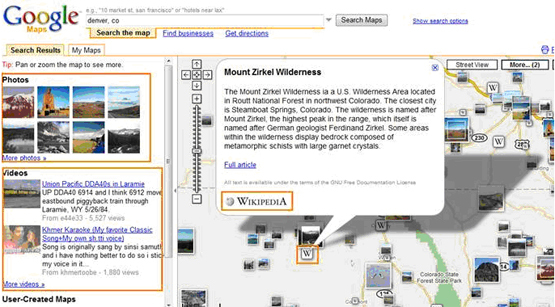 The User-Created Maps are pulled from the My Map feature through Google Maps. 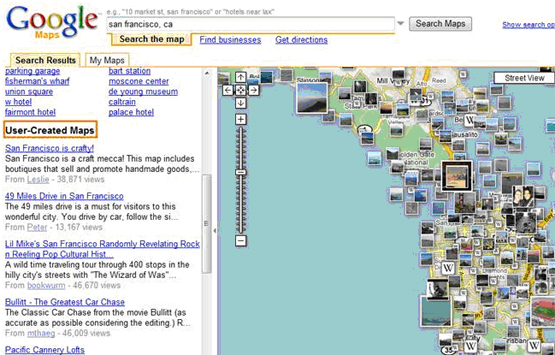 The My Map feature allows regular users to create their very own list of favorite restaurants, attractions, hotels, etc. by placing push pins on the maps, writing descriptions, adding your own photos and much more. You then have the option to make your personal Maps public or not. On the upper right corner of the map, you also have the option to click on the “More…(2)” icon. This will allow the current map to display the local photos from Panoramio, videos from YouTube, and excerpts from Wikipedia. By clicking on the “W” icons on the map, an excerpt about the location or attraction will pop up, which is all generated from Wikipedia. The overall experience for a Google Maps user has become more comprehensive, allowing users to access and share more information about a particular city. It’s rare to locate a professional person in whom you may have some confidence. In the world in the present day, nobody truly cares about showing others the way in this matter. How fortunate I am to have now found such a wonderful blog as this. It’s people like you who really make a true difference these days through the suggestions they reveal.